Corset turtle hates humanity, and can’t eat anything but peas. As a six-year old, I told my grandma about the dangers of plastic six-pack rings. She bought a lot of Sprite back then. Because she’s a sweet and conscientious old lady, she’s been snipping six-pack rings every since. I’m thirty now. Grandma’s awesome. 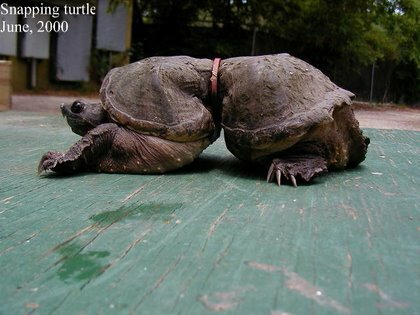 What is the restraining item in the first pic of the snapper? Is it a ring from a plastic milk jug? I just had to agree with you. I did the same thing with my grandma. When I told her about the six-pack rings as a child, I remember seeing her cut up those rings to be no larger than 1 inch pieces. It was a bit excessive, but she would never hurt anything, and I suppose she didn’t want to take any chances. I still make sure I cut up rings of plastic – whatever they may be – before they are thrown away. I like to tear up those plastic rings by hand and pretend I am the hulk. ECO UNFRIENDLINESS MAKE HULK MAD! HULK IS GREEN! challenge: fold six rings in a way such that, one cout will eliminate all threats. // is this poosible? Not cutting them up and throwing them in the trash won’t hurt any turtles. 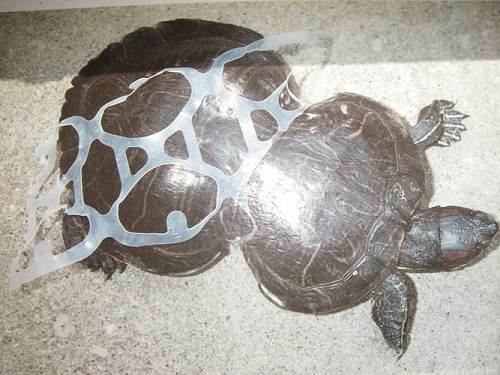 Throwing them outside at your party at the lake will hurt turtles. I feel sorry for the poor thing. How can it breathe?